There certainly are those that believe Google has landed a game changer with their social network Google+ and those that are ready to claim it’s a nice niche platform for techie kind of people. Personally, I think it’s currently the best platform for business in terms of the functionality it offers, but of course is currently lacking the dedicated user base making it hard to imagine a business setting up shop there exclusively. Even with that limitation Google+ has indeed changed some things already. Its existence can certainly claim credit for a number of enhancements for business users rushed in recently by Facebook. Google+ ties together many of Google’s already entrenched, but untethered services such as Picasa, YouTube, GMail and Apps. 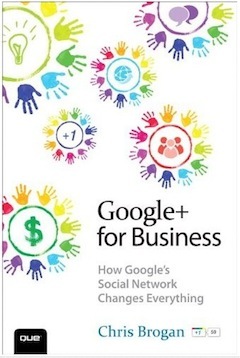 Brogan boldly and passionate professes, as the title of the book suggests, that Google+ is the next super power in the social network game and cares little that Facebook has hundreds of millions of users more. It’s the Google connection and the Google dominance in other important business areas that intrigues and excites Brogan most. Again, from a strictly business point of view, I have to agree. Now is the time to grab, build and enhance your Google+ profile and brand page. This action will never hurt you and you may discover that actively placing content from your blog on Google+ is a way to get your content indexed by Google even faster. One of the things I like most about Brogan’s book, however, is that while he firmly supports the use of Google+ for business, much of the advice he gives about how to use it is solid advice for anyone that wants to build a following, find great content and engage users on any platform.